The Graco Modes Duo double stroller is extremely versatile! With 27 riding options, from infant to youth, you can configure this stroller for the best fit for your growing family. 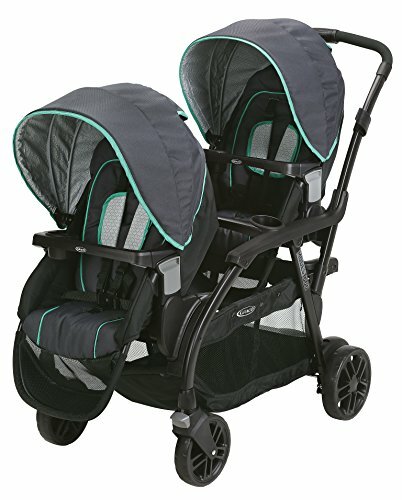 The Graco Modes Duo Stroller accepts TWO Graco Click Connect Infant Car Seats, connecting with a secure one-step attachment. It has a standing platform and bench seat for your older child, and two reclining, removable seats that allow for stroller customization. Convenience and comfort features include locking front swivel wheels for increased maneuverability, extra platform wheels, one-handed standing fold, and pivoting child's arm bar with cupholders. The Graco Modes Duo Stroller helps you get the most out of every ride! Two removable, reclining seats can be positioned multiple ways; built-in bench seat gives your big kid a place to rest; both front and rear seats hold up to 50 lb.